ORLA T.X. 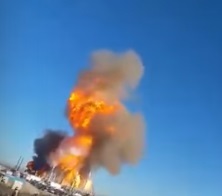 (KRQE) – Two people are injured after a major explosion at a gas plant just outside the state line in Texas. First responders say that’s it’s a miracle everyone is okay with an explosion that big. It happened around 9:30 Thursday morning at the Ramsey Natural Gas Processing Plant just about 5 miles past the border near Orla, Texas.